LOVINGTON, N.M. – Just 15 minutes after his final ride of the night, Colten Jesse had already strapped his Lea County Xtreme Bulls trophy buckle on his belt. He earned the right to do that by dominating Tuesday night’s performance at the Lea County Fair and Rodeo. Jesse won both go-rounds and the average championship to pocket $11,878. The victory pushed his season earnings to $35,600 and moves him into the top 25 in the bull riding world standings. More importantly, he moved into third place in the race for rookie of the year. It worked out. Jesse won the first round with an 88-point ride on Salt River Rodeo’s Silence Reigns. He then matched moves with Lone Star of the Pete Carr’s Classic Pro Rodeo outfit for 90 points to win the championship round. Of course, having been rising through the ranks – from mutton busting to calf riding to steer riding and now competing in ProRodeo – he understands what it takes to find success in the arena. Fortunately he mastered the competition and his bulls Tuesday night. First round: 1. Colten Jesse, 88.5 points on Salt River Rodeo’s Silence Reigns, $3,426; 2. Scottie Knapp, 87.5, $2,627; 3. (tie) Rorey Maier and Roscoe Jarboe, 83, $1,599 each; 5. (tie) Joe Frost and Sage Kimzey, 82, $685 each; 7. Jacob O’Mara, 81, $467; 8. Pistol Robinson, 80.5, $343. Final round: 1. 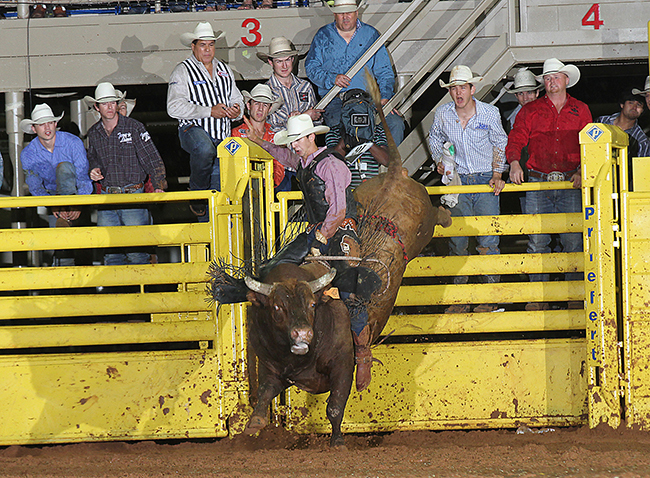 Colten Jessie, 90 points on Pete Carr’s Classic Pro Rodeo’s Lone Star, $2,741; 2. Sage Kimzey, 87.5, $2,132; 3. Ardie Maier, 86, $1,599; 4. Tim Bingham, 84, $1,142; no other qualified rides. Average: 1. Colten Jessie, 178.5 points on two rides, $5,711; 2. Sage Kimzey, 169.5, $4,379; 3. Ardie Maier, 166, $3,235; 4. Tim Bingham, 162, $2,094; 5. Scottie Knapp, 87.5 points on one ride, $1,332; 6. (tie) Roscoe Jaraboe and Rorey Maier, 83, $857 each; 8. Joe Frost, 82, $571.